Integrated remote deployment tool for one-click software distribution across the local network. It helps you to make remote software deployment by replicating changes, performed by any application installation or uninstallation, across the network. Detected file system and registry changes can be automatically transformed to installation package, ready for remote deployment. Deployment process is silent and clientless. ...... Deployment Kit supports service install without the need of reboot after install. It also supports drivers install and then with a reboot. Any installation or uninstallation process, executed locally, can be replicated to one or multiple remote PCs to perform mass remote software installation or uninstallation. No client modules installation or special remote PCs configuration is required. 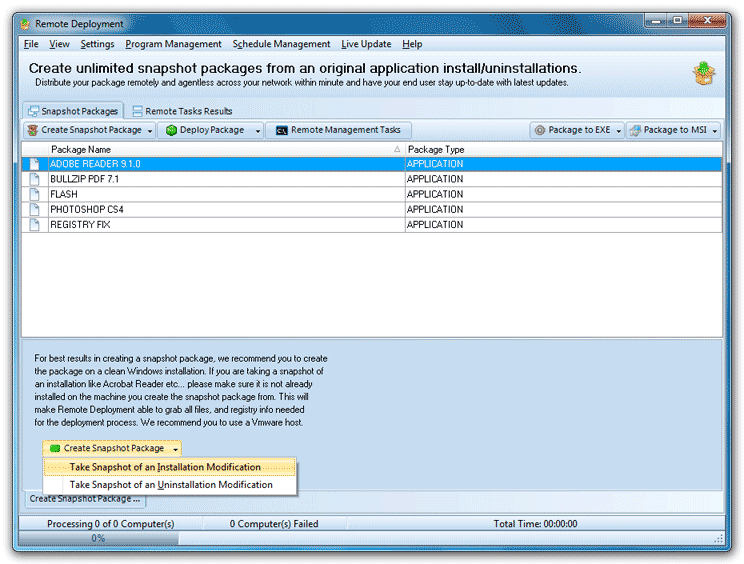 Deployment package is automatically prepared by taking two OS snapshots: before and after running application installation or uninstallation procedures. Detected file system, registry and other changes are included into the package. Qweas is providing links to EMCO Remote Deployment 5.3.15 as a courtesy, and makes no representations regarding EMCO Remote Deployment or any other applications or any information related thereto. Any questions, complaints or claims regarding this application EMCO Remote Deployment 5.3.15 must be directed to the appropriate software vendor. You may click the publisher link of EMCO Remote Deployment on the top of this page to get more details about the vendor.